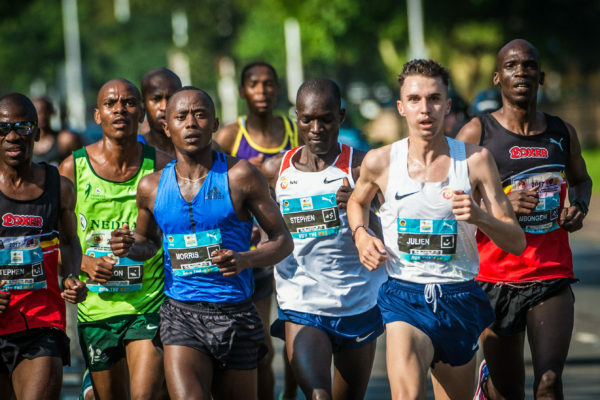 Breaking 28 minutes over 10km is the target for 22-year-old Swiss National Record Holder, Julien Wanders, as he returns to Durban on Sunday, 14 October 2018 for that onslaught at the 2ndrunning of the FNB Durban 10K CITYSURFRUN. Wanders was third across the line at the inaugural event in 2017 with a new personal best of 28:13, then a Swiss National Record, one which he subsequently broke on 31 December in Houilles, France. Wanders came dreadfully close to dipping under 28 minutes there, crossing the line in 28:02 for the current Swiss National 10km record. Durban will once again be Julien Wanders’ first 10km of the season on the road, and given how 2018 has gone for him, that target of sub 28min is well on the cards. Wanders has every reason to be confident, he has run personal bests in 2018 for the 1500m (3:43.39 – Zofingen, Switzerland, 14 July), 3000m (Bellinzona, Switzerland– 18 July), 5000m (13:24.79 – Berlin, 14 August) and the half marathon (60:09 – Barcelona, 11 February). All those bests are also national records. The half marathon best in February set Wanders up nicely for the rest of 2018, as he followed that up with an 8th place finish at the World Half Marathon Championships in Valencia, Spain in March before hitting a very successful track season. Van Zyl, if she breaks 32 minutes, stands to earn an additional R30 000 to any prize money she may earn on race day, and Steyn will walk away with an extra R20 000 if she goes under 33 minutes.